Look at today’s chart for Sun-soon-to-be-Java. Huge pop. From $4.93 yesterday to $5.00 today, a gain of 7 cents or 1.42%. And look at that spike in volume today. Sun is on a roll! Jonathan, I owe you an apology. 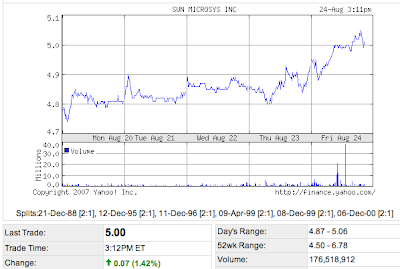 This ticker symbol decision is looking like the smartest thing you’ve done since taking over at Sun. I commend you.